automotive garage in front of Backus Co.
Backus purchased this building in the center of the page in 1911. Shares were sold to raise the capital. There were a total of 20 shareholders. 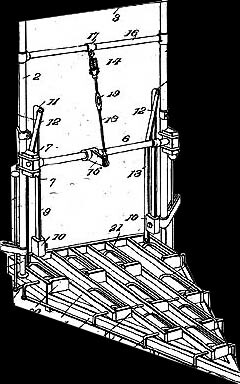 In 1912 J.C. Backus invents the robe rail lock and markets it. Then F.H. Biever and W.L. Pierotti Sr. purchase the company from the estate. 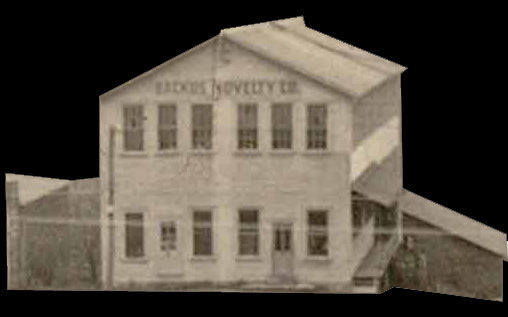 From the 1930's until the present Backus Company has manufactured metal products, such as drawn shells for lighter cases, clock cases, and smoking pipe components. J. C. Backus, of the Backus Novelty Co., has just invented an ingenious contrivance in the shape of a letter scales, that promises to be a big seller. These scales are perfectly accurate, and will weigh up to four ounces, and will sell at retail at the extraordinary low price of ten cents. At this price these scales will find their way to every desk in this country. Excavation work near the left front of the Backus Novelty building on Water Street halted suddenly Tuesday afternoon- because of the discovery of two coffins on the site of the work by two laborers. 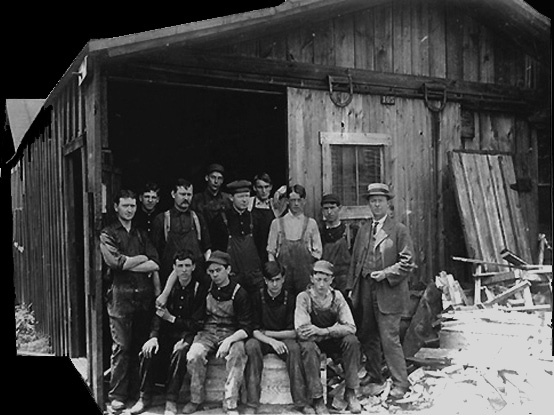 Carl Kohn and Sylvester Keesler who were engaged in excavating to make room for a gasoline storage tank, made the somewhat gruesome discovery at about 3:00 p.m. Mr. Keesler struck an object with his pick, but thinking it was rock, he continued with his labor. An instant later the instrument broke through the top of the casket, revealing a skeleton. At this time the second coffin became visible. The boxes are believed to have been home made, being narrow on one end and large on the other. They were in a remarkable state of preservation, considering the fact that they had been underground for at least more than 65 years. Only one of the coffins was completely unearthed. A new box was constructed in which the coffin and the remains were placed and reenterred in Rose Hill Cemetery. The other coffin was not disturbed. Told of the discovery, Richard Shattuck, local historian, revealed some very illuminating information. Records in Mr. Shattuck's possession relate that a cemetery was in active existence on the plot between 1818 or 1825 and the late 1870's. A Mr. Digel operated a monumental works nearby during the latter part of this period. In 1882, Rose Hill Cemetery was founded, although it is believed that this spot was used for interment prior to that time. A marker in Rose Hill Cemetery carries a date mark of 1859. However, Mr. Shattuck is of the opinion that the body was removed from the Water Street plot to its present location. 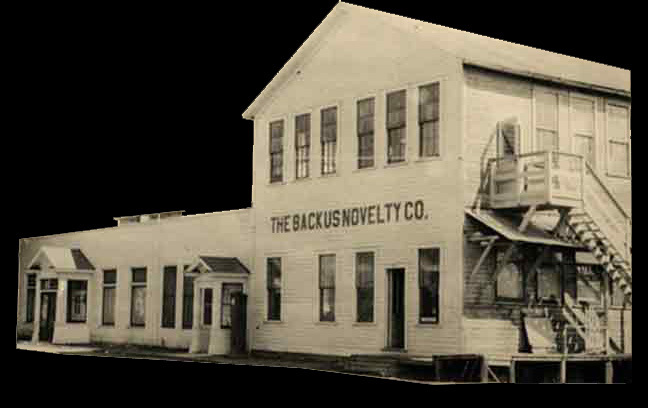 Older residents recall that when the building housing the Backus Novelty was being constructed, several coffins were unearthed on the site. Mr. Shattuck was of the belief that the Water Street cemetery contained perhaps seventy-five or more bodies. It is quite possible, in his opinion, that veterans of the Revolutionary War and the War of 1812 were buried here. A painting in Mr. Shattuck's possession reveals that the Water Street cemetery ran East and West from Fulton to Church streets. This work of art originated in 1860.